“When will we get a stop?” – a frustrated voice just swept my ears & broke the constant monotonous motor sound with whom I was getting relaxed somehow. I turned my neck left, & found Preetraj was really curious to know the answer. Generally as much as I traveled in parts of India, these long distance covering buses provide a half-stop (not a full stop) on the way- providing some time to the passengers, so that they can drive away their usual hungers. “I dont know, may be with in an hour!” & I made a quick peep to my smart phone screen. Its already 11 PM, & I understood how much valid comment just I made. Being ultimate restless I went to the driver’s (they called its pilot’s cabin) end & asked the same as Preetraj. What I got was something unexpected as we would not be provided any break, only after 30 minutes, a chai (Tea) break would be rewarded to us for showing this tolerance. As I moved back to my seat , I found Ujjwal, soumodipto having some happy naps. Though I know its not a big deal for Ujjwal to get close with sleeping goddess. some one just supply him a clean blanket & he’s cozy to sleep. 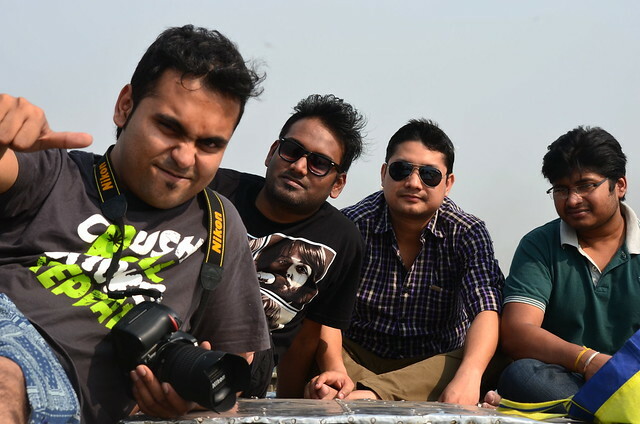 In the last moment it was quite tough work to manage all the guys for this trip, as it was short noticed one again. 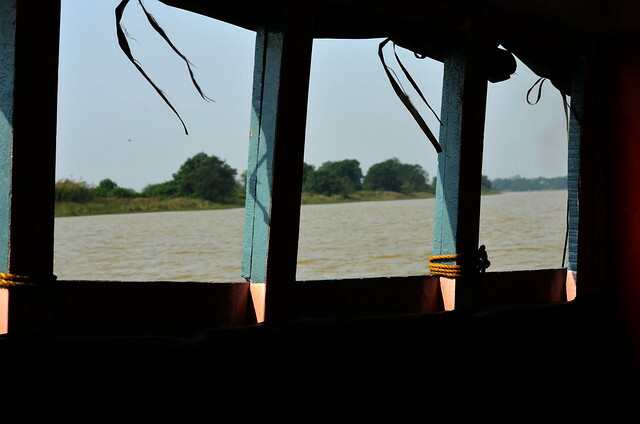 We were rushing to Bhitarkanika (or Bhitorkonika) natural forest. 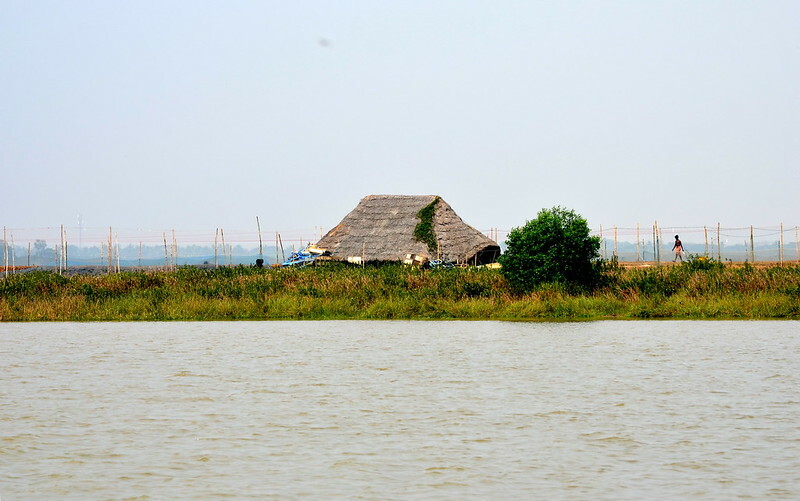 As you people almost know that we prefer to explore those unknown places, so as to publicize the tourism. we firstly preferred trains, but there were some uncertainty with reservations. so finally the bus ride won with major votes. Thank God, we got a travel agency’s number where booked the seats over phone. It didnot take a decade to reach the half stop, where the driver was supposed to take his dinner & what about us?! Forget it, go & have some cup of tea. 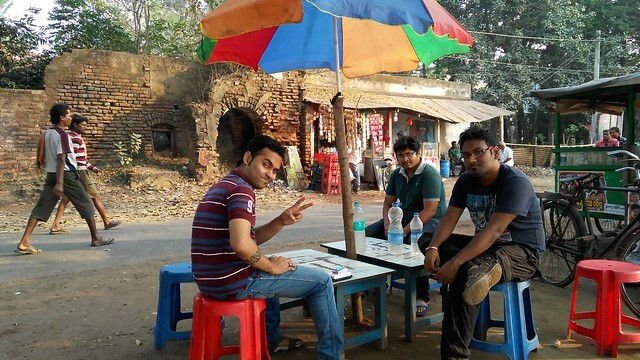 What was most irritating, the bus halted to a place where there were no dhaba, hotels it was just near the border of West Bengal-orissa. It will be a real offense if I say the bus service was bad. 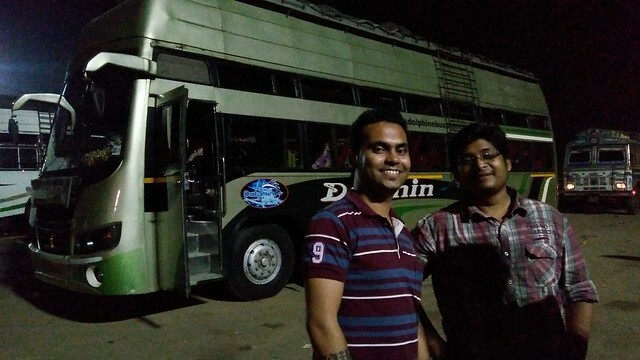 The bus did a real awesome job- it reached Bhadrak station around 3:30 AM, setting out at 9 PM. It was the formal gathering point of Core committee, as Souradeep was moving from Bhubaneswar. Then it was again some 52 KMs to go to reach Chandbali. Bus service from 5AM, then we had to wait there some 1 hour. We decided to a have an trekker ride, as we were seeking some time saving methods. But believe me, this trekker ride was a smashing one- neither the road was about to end nor the time. The road was not so easy & even. Finally after 1.5 hours we have reached a spot,where the left end is guided by a flowing river & on right there was a well built hotel. We assumed it as our destination. 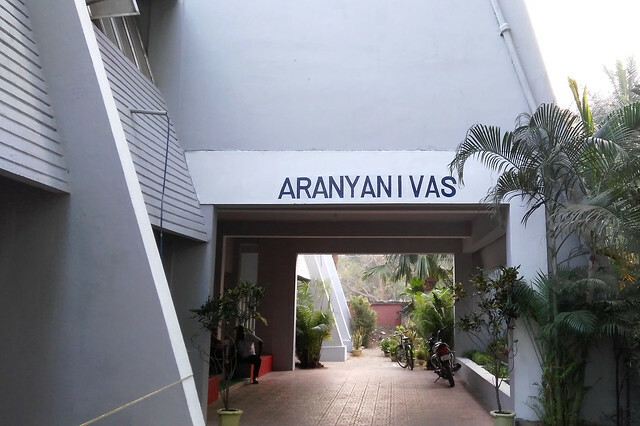 Slowly stepped towards the white colored building & found the name as “Aranya Nibas” (Jungle stay) – though the surrounding was not as it sounded. It was like a small market in a village where tourism was just about to flourish. 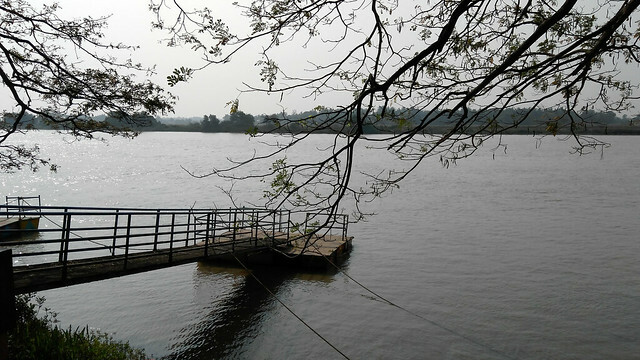 Believe me, after the formal entries, when we checked in the room, it was simply awesome- the large room, some easy chairs, the balconies on two sides of room- one guiding the view across the river ‘Baitarani’, another blending the natural green through the trees & unexplored pastures. We just guessed that we were having so much fun for this weekend, & we carried stuffs for our enjoyment. So, feelings of joy already began to tickle our curiosity. 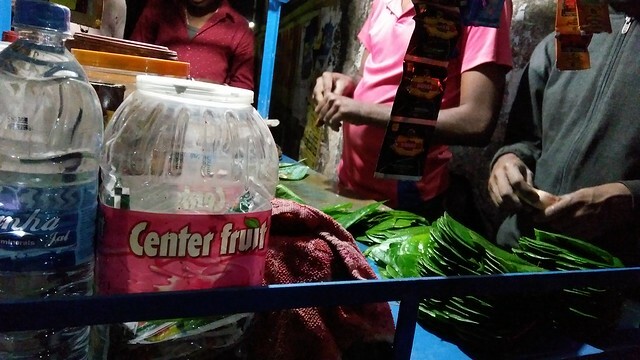 No wonder being extreme hungry, we were searching for foods, where the Odissa fastfoods played a decent role with ghugni(chatpatta), kochuri (puri), idly (some weird shape)- but for all ghugni is common side dish. We bathed very quickly & made ourselves ready for the day’s adventure. In between the boatman already appeared- we negotiated price which came to a fair deal. 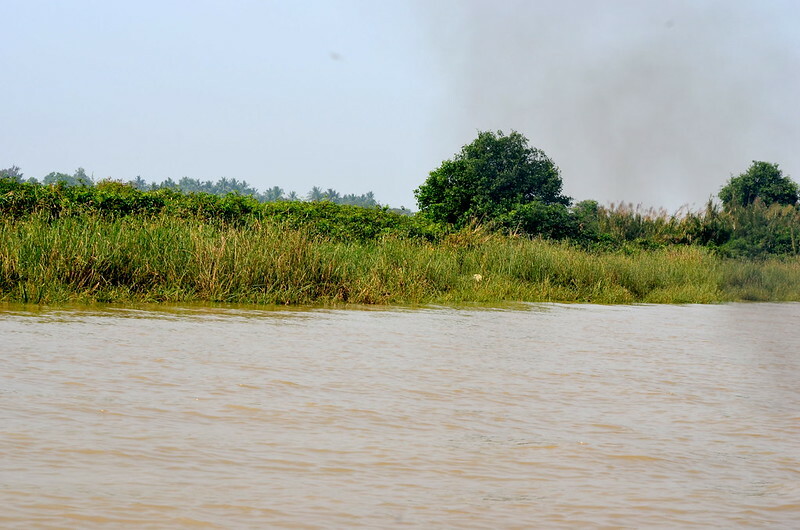 In front of our Aranyanivas, river Baitarani stretched her arms to an indefinite end, the bank contained our boat – yeah it was a pleasant surprise that a service boat was eagerly waiting for us, I mean its personal boat now. 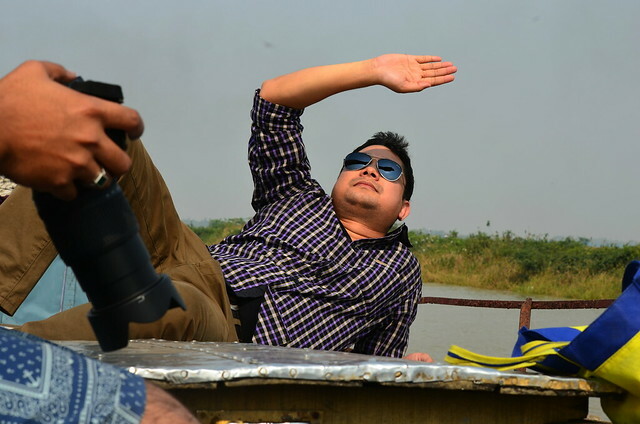 Ujjwal took the breakfast in boat, he disappeared while it was the grand breakfast time. The boat contained two pilots- one stand by just in any case of emergency. we were just like dancing in ecstasy. 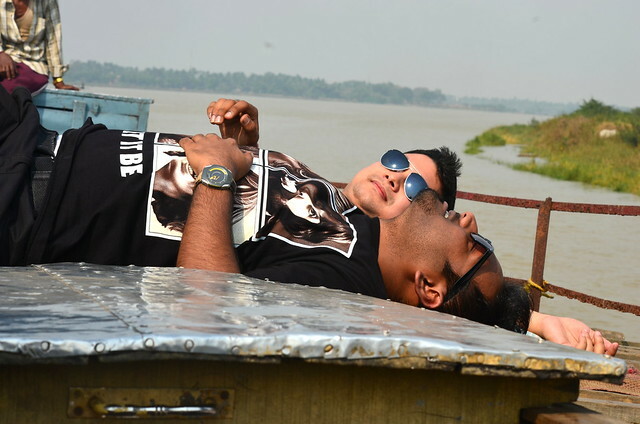 It was hard to resist oneself to stick to a particular place- the joy of standing on a roof of boat, on another hand placing the body inside the well decorated seats- executing both at the same time was not possible. We could not resist to unwrap the cameras now. 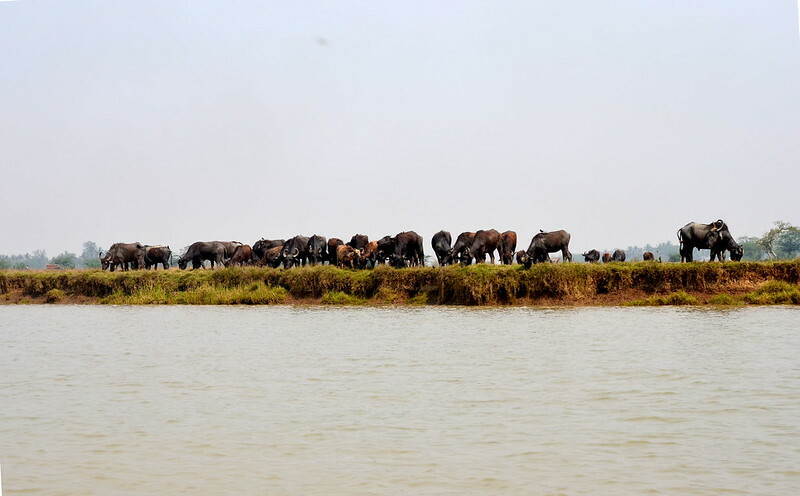 The two banks were hardly seen – but whenever it was needed to take turn, we came close to banks, where green pastures, paddy fields, buffalo flocks were seen which befits the portrait perfectly. The sky was prussiany blue – only except those exhausted smokes by the engine, otherwise it was clean like a painted picture. The boat ride was open under the sun, so it was pretty hard to stay above the roof, we decided to came down under the shelter, where out photographic experiments met its unique results. I was amused with the enchanting beauties of nature – as it revealed its majesties everywhere. Even wearing out sun glasses could not resist eyes. 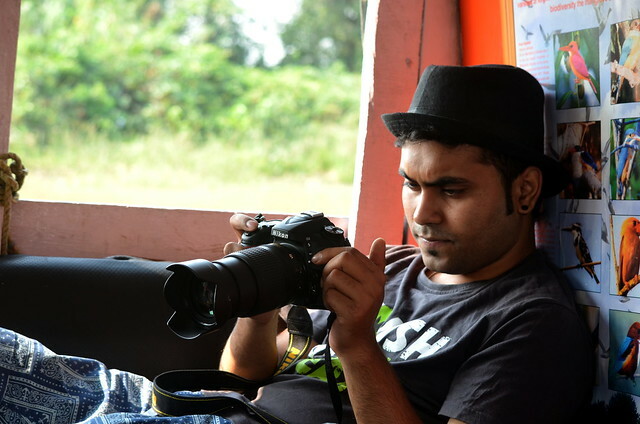 Read the rest of story in Bhitarkanika National Forest trip (part-2). Could you share any contact deatils of the Aranya Nivas?